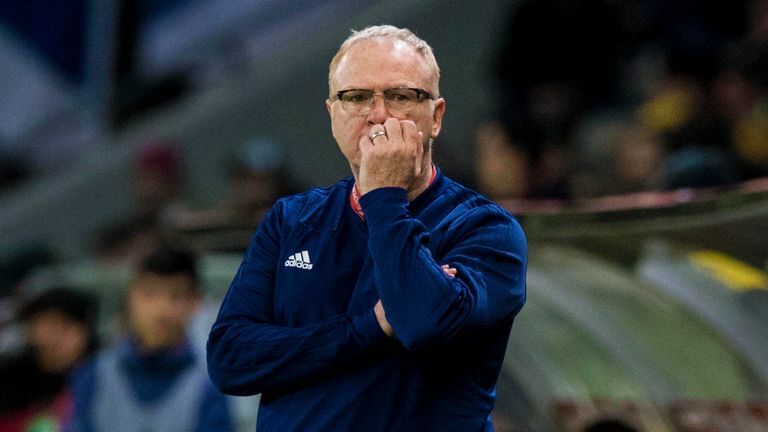 Scotland manager Alex McLeish says his side cannot avoid the negativity surrounding their 3-0 European Qualifiers loss to Kazakhstan. After guaranteeing a Euro 2020 play-off place via last year's UEFA Nations League, where they won three of their four games, Scotland's bid for automatic qualification got off to a humiliating start with defeat against the team ranked 117th in the world. The response to the defeat has understandably been negative, but McLeish said he does not want to hide his squad from it. "You can’t avoid it," he told Sky Sports. "I’ve been in the game a lot of years and you have to take the good with the bad. "I’ve had a lot of success. When we have a reverse, and there’s a bit of negativity, the best thing to get rid of that is to win the next game. And that is our plan." Scotland will look to get back on track against San Marino - live on Sky Sports Football at 5pm on Sunday - and McLeish says the return of captain Andy Robertson, Callum Paterson and Ryan Fraser will give the team a huge boost. Despite his team becoming "powerless" against Kazakhstan, he says they understand what is at stake in the second game of qualifying. "We have to win," McLeish said. "We are confident about the outcome. "I said that [we have to bounce back] before the Albania and Israel games and we went and did the business so yes, you have to go and prove it but I don’t see any reason why we can’t make it better in the second game. "And it’s a long process, the group stage. The first game is over. We didn’t do it. "All is not lost. Believe me, there will be other trip-ups in this group stage."